Rich Hacker worked in professional baseball for many years as a player, coach, manager, and scout. He had a brief stint in the majors as a shortstop for the Montreal Expos in 1971 but is best known as a coach for the St. Louis Cardinals and Toronto Blue Jays. Richard Warren Hacker was born in Belleville, in southern Illinois, not far from St. Louis, on October 6, 1947, the first of three children of Paul Emil George Hacker (1922-1986) and Dorothy Deane Ablett Hacker (b. 1927). His sister Ruth Ann was born in 1950 and the third child, Jeanne Louise, was born in 1955. Paul's younger brother, Warren, pitched in the major leagues for the Chicago Cubs (1948-56), Cincinnati Reds (1957), Philadelphia Phillies (1957-58), and Chicago White Sox (1961). Hacker grew up in nearby New Athens, Illinois, attending school there. He played in the New Athens Khoury League (their version of Little League) from 1953 through 1960. He played baseball and basketball at New Athens High School from 1962 through 1965 and played American Legion ball in 1964. New Athens High has one other major-league alumnus: Whitey Herzog. The St. Louis Cardinals selected Hacker in June 1965 in the first-ever amateur draft held by baseball. Hacker was selected in the 39th round, the 688th overall pick. Instead of signing with the Cardinals, he chose to go to college, attending Southern Illinois University in Carbondale. He played freshman basketball and one season of baseball (1967), playing for former major leaguer Joe Lutz. Hacker led the baseball team in hits (35) and doubles (6) and was named MVP of the Saluki Nine that played in the NCAA tournament. After his sophomore year in college, Hacker was picked by the New York Mets in the June 1967 draft in the eighth round, the 182nd overall pick. He signed with the Mets, having been scouted by Charley Frey for the New Yorkers. The Mets assigned the 6-foot-tall, right-handed Hacker to their short-season Northern League team in Mankato, Minnesota, where he led all league shortstops in fielding percentage while playing in 49 games of the 70-game season. The squad was managed by Buddy Peterson, who had played 13 major-league games at shortstop for the Chicago White Sox and Baltimore Orioles in the middle 1950s. Hacker was promoted to Visalia in the California League for the 1968 season and he played there for 1&frac12; seasons. In 1968 Hacker played 76 games for the last-place team and hit .224. Among his teammates that season were future major leaguers Ken Singleton and Jerry Morales. Hacker started the 1969 season in Visalia but was promoted to Memphis of the Double-A Texas League in midseason. The team, featuring such players as Jim Bibby, won the East Division of the league. Hacker played in 27 games for Visalia and 34 for Memphis that season. Hacker started the 1970 season with Memphis but went on the disabled list on May 2 after injuring his left knee on a ground ball up the middle. He turned to run toward the path of the ball and twisted his left knee, injuring the medial meniscus in the leg. He did not have surgery but was finished for the season. Hacker wore a brace and then strengthened the knee through therapy during the offseason. The injury canceled a promising season for Hacker as he had collected 14 hits in only 43 at-bats before getting hurt. He never ran as well again after the injury. The Mets traded Hacker with outfielder Ron Swoboda to the Montreal Expos for outfielder Don Hahn on March 31, 1971. Hacker was assigned to Winnipeg of the Triple-A International League that season. He played 98 games for the Whips and was the primary shortstop on the squad, playing 94 games at the position. One other infielder on the squad was future major-league manager Jimy Williams. Hacker's typical strong fielding and weak hitting continued in his new organization, as he hit .235 for the season with Winnipeg but had the highest OPS (on-base average plus slugging average) of his career that season at .620. When the Expos shortstop Bobby Wine was hurt in mid-June, Hacker was called up to the Expos and made his major-league debut on July 2 by playing a doubleheader against the Philadelphia Phillies at Parc Jarry in Montreal. In the first game, Hacker hit eighth and went 0-for-3 against Rick Wise, who threw a complete game while being charged with the loss. Hacker struck out in his first at-bat and later lined out and grounded out. In the second game of the twin bill, Hacker again played shortstop and batted eighth. After striking out in the second inning, he doubled to right field off Woody Fryman and drove in a game-tying run for his first major-league run batted in. In the two games that day, Hacker collected 2 putouts and 10 assists and participated in one double play. The next day Hacker again started against the Phillies and collected his second hit, a single to left field in the seventh inning off Bucky Brandon. On July 4 Hacker played in the finale of the series, again batting eighth. In the eighth inning, he walked with two out and scored his first big-league run two batters later on a single to left by Ron Hunt. Hacker traveled with the Expos to New York to play the Mets at Shea Stadium. He started both games of a doubleheader on July 5, going 0-for-6 with four strikeouts. He was removed from the second game in the middle of the fifth inning as part of a double switch. Bobby Wine returned to the lineup on July 6 and, with no reason to keep Hacker in the big leagues, he returned to Winnipeg to resume his minor-league career. To this point, Hacker had been a right-handed batter but the Expos told him to learn how to hit left-handed to become more valuable to the team. He had collected two hits in 19 at-bats with the big-league team and walked only once, so it was thought that adding a switch-hitting capability might improve his offense. The Expos recalled Hacker, now a switch-hitter, to the big leagues in September and he played on September 3 and 4 in Pittsburgh, entering both games as a late-inning replacement at shortstop. On the 6th he played the ninth inning against the Mets in Montreal. He had no plate appearances in those three games. Hacker did not play again until September 21, when he started the first game of a doubleheader against the Phillies in Montreal. He went 0-for-2 with a walk before being removed for pinch-hitter John Bateman in the ninth inning with the team trailing 5-4. Hacker started the next day against the Phillies and collected his third major-league hit, a single to left off Rick Wise that drove in Ron Fairly from third. On September 23 he started against Philadelphia and was 0-for-2 before Fairly pinch-hit for him in the sixth inning. The Expos traveled to St. Louis, in Hacker's home territory, to play a series against the Cardinals. He played in all three games, starting two, and collected his last big-league hit. On September 24 Expos manager Gene Mauch inserted Hacker into the lineup as part of a double switch in the ninth inning after the Expos had tied the game in the top of the frame. Hacker grounded out in the tenth inning and the Cardinals won the contest in the bottom of the inning on a grand slam by Joe Hague. The next day Hacker started the game, walked in the fifth, and scored on a Stan Swanson pinch-hit home run off Jerry Reuss. Jim Fairey batted for Hacker in the sixth inning. In the last game of the series, on Sunday, September 26, Hacker started at shortstop and singled to left field to start the top of the ninth inning off Redbird hurler Dennis Higgins. In the fifth inning, Hacker made his only major-league error, on a groundball by Milt Ramirez, who eventually scored an unearned run on a single by Joe Torre. Hacker's miscue was one of four errors in the contest by the hapless Expos, who lost, 7-1. The Expos finished the season with three games at home against the Cubs from September 28 through 30. Hacker played once that weekend, entering the game on the 29th in the top of the ninth as a defensive replacement. He struck out in the bottom of the frame in his last big-league plate appearance. In December 1971 Hacker married Kathryn Louise Hunter, two years his junior, whom he had met in 1968 in California while playing for Visalia.&nbsp;She was living with her sister and working a summer job in the San Francisco Bay area. A mutual friend, a serviceman&nbsp;stationed at Treasure Island, a Navy base in San Francisco Bay, asked to go to Visalia to see Rich. The two men had played ball against each other in school. Rich and Kathryn reconnected two years later when she was attending Southern Illinois University and rooming with Rich's cousin. Hacker played two more seasons, 1972 and '73, with the Expos' Triple-A team in the International League. The club, now in Hampton, Virginia, was called the Peninsula Whips. Hacker played 209 games for Peninsula in those two seasons before ending his playing career (except for a brief encore in 1979). In his brief major-league career Hacker collected four hits, including one double, in 33 at-bats. He walked three times while striking out in 12 plate appearances. For the next two seasons, Hacker was out of baseball. He worked as a purchasing agent for Allied Chemical and hated it. When the plant closed, he went back to school at Southern Illinois University. Then, during the 1975 Christmas season, he was named the baseball coach at Southeastern Illinois College, a community college in Harrisburg, Illinois. Hacker coached there for three seasons (1976-78) and the school won a state championship in in 1977. That club lost in a regional tournament and did not progress to the national tourney. During the summers of 1977 and 1978, Hacker coached in the Alaskan Summer League. He worked with Mark Newman, who at the time was the pitching coach at Southern Illinois University in Carbondale and in 2010 was senior vice president of baseball operations for the New York Yankees. The Kenai team that Hacker coached won the National Baseball Conference title in Wichita, Kansas, in 1977. Rich and Kathryn celebrated the birth of their first child, Roger, in September 1977 while living in Harrisburg. Roger later worked for a few years in the public-relations department of the Chicago Bears (NFL) before returning home to St. Louis. In 1979 Rich was hired as a scout by the San Diego Padres. He spent some time in Houston scouting pitcher Mark Thurmond and signed him for the Padres. Thurmond had an eight-year major-league career, much of it as a reliever. Glenn Ezell, the manager of the Amarillo Gold Sox in the Texas League, suffered a heart attack in 1979, so the Pads sent Hacker there to help out. While there, he played six games &ndash; four at second base and two at third base. He collected two hits in 14 at-bats and walked twice. This was Hacker's last appearance as a professional player. Including that brief appearance in 1979, Hacker played all or parts of eight seasons in the minor leagues. He appeared in 512 games, collecting 353 hits in 1,558 at bats. Those hits included 36 doubles, 12 triples, and 5 homers. Although he was a shortstop he also played second base and third base and even caught a few games for Peninsula in 1973. Hacker continued to scout for the Padres in 1980. In 1981 he was hired by the Toronto Blue Jays to scout. He also coached the Blue Jays' Gulf Coast League team in Bradenton, Florida, that summer. The league was made up mainly of teenagers from the Caribbean and was intended as a first experience in the United States for these young players. In June of that year, the Hackers celebrated the birth of their second son, Scott. Hacker's hometown team, the St. Louis Cardinals, hired him as a minor-league manager in 1982. He was assigned to the Johnson City (Tennessee) Cardinals of the Rookie-level Appalachian League. The squad, which featured future major leaguers Vince Coleman, Mike Hartley, Stan Javier, and Terry Pendleton, finished with a 32-35 record, first in the Southern Division. Kevin Maris, son of Roger, also played for Hacker for part of the campaign. Hacker returned to Johnson City for the 1983 season to lead a team that saw 34 different players on the roster, none of whom ever played a major-league game. Hacker was the lone coach on the staff that summer for a team that finished with a 30-42 record, good for sixth place in the seven-team league. In September 1983, the Hackers welcomed their third child into the family with the birth of Kathryn Ann, who is known as Katy. Hacker was sent to Erie, Pennsylvania, for the 1984 season to manage the Cardinals' short season A team in the New York/Penn League. This squad finished with a 43-31 record with three future big leaguers on the roster: Lance Johnson, Greg Mathews, and Craig Wilson. In 1985 Hack returned to Johnson City for his third campaign in the Appalachian League. This team finished the season in second place with a 39-29 record with four future major leaguers on the roster: Alex Cole, Tim Jones, Joe Magrane, and Steve Peters. Hacker received his call to the majors for the second time in 1986, as he was named the first-base coach for St. Louis. This was the first of five years in which he was a member of Whitey Herzog's coaching staff in the Gateway City. This team compiled a 79-82 record and finished third in the National League East Division. In 1987 the Cardinals won 95 games to finish first in the division and beat the San Francisco Giants in the League Championship Series, thus earning Hacker his first trip to the World Series. The Minnesota Twins beat the Cardinals in seven games. In 1988 Hacker returned to the first-base coaching box for the Cardinals, who could not repeat their performance of 1987, as they finished in fifth place in their division with a 76-86 record. Manager Herzog picked Hacker as a coach for the National League All-Star team, and thus appeared in the game played in Cincinnati. 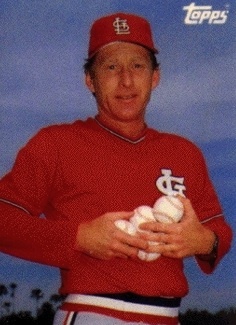 After Nick Leyva, the Cardinals' third-base coach, was named the manager of the Philadelphia Phillies for the 1989 season, Hacker was switched by the Redbirds from first-base coach to third-base coach, a job he held for two seasons. The 1989 team won 86 games but finished third in the division behind the Chicago Cubs and New York Mets, while the 1990 squad won only 70 games and finished last. Whitey Herzog quit as the manager after 80 games in 1990. At the end of the season new skipper Joe Torre hired his own coaches for 1991 and Hacker was dropped. He was hired by the Toronto Blue Jays as their third-base coach in 1991 and the Jays won the American League East Division title but lost in the Championship Series to the Minnesota Twins, 4 games to 1. On September 7, 1992, the Jays lost a 12-inning contest in Kansas City, 5-4, but the big news that day for the Hacker clan was that Rich was ejected from a game for the only time in his major-league career. He objected to the strike zone as called by umpire Greg Kosc, and the arbiter excused Hack for the rest of the contest. In 1992 the Blue Jays won five more games than in the previous season to finish with a 96-66 record and repeat as division champs. They beat the Oakland Athletics in the League Championship Series and went on to play the Atlanta Braves in the World Series. The Jays beat the Braves in six games, thus earning Hacker his first World Series championship ring. Hacker returned as third-base coach with the world champions in 1993 but this season was to prove a difficult one for the Hacker family. Toronto finished the first half on July 11 with a 49-40 record to lead their division. Manager Cito Gaston, as the skipper of the previous year's American League World Series team, managed the AL squad in All-Star Game on July 13 and took his coaches with him to the game in Baltimore. However, Hacker decided to skip the exhibition and go home for the three-day break. After flying to St. Louis, he was driving home in a borrowed van when he encountered two vehicles drag-racing across the Martin Luther King Bridge. One of the vehicles struck Hacker's vehicle head-on and he suffered a fractured right ankle and severe head injuries. Taken to the intensive-care unit at St. Louis University Hospital,&nbsp;Hacker was in a coma for a few days but eventually regained consciousness. The Blue Jays, who had led the AL East again in 1993, invited Hacker, in the midst of a long recovery from his injuries, to Toronto to throw out the ceremonial first pitch for a game during the World Series. The Jays won their second consecutive World Series title that season when Joe Carter hit a Series-ending home run in Game Six with Hacker on the bench instead of at his usual spot in the third-base coaching box. Hacker was replaced as the third-base coach for 1994 by Nick Leyva, who had been fired by the Phillies and 1991 and joined the Blue Jays. Leyva had filled in for Hacker during the second half of the 1993 season. Hacker was still a member of the coaching staff but held other off-field responsibilities due to the lingering effects of his injuries. His main task was to create hitting charts for opposing teams during games. In 1995 he was not rehired by Toronto. The next year Hacker rejoined the Padres as an area scout, a position he held until he retired at the end of 2003. He was responsible for scouting amateur players in the Northeastern states from New Jersey to Maine during this time. In 2001, Hacker was elected to the Midwest Professional Baseball Scouts Association Hall of Fame for his long service to the profession. In 2005 he was elected to the Southeastern Illinois College Hall of Fame for his coaching accomplisments there in the 1970s. Since his retirement from scouting, Hacker has spent time enjoying his family and living in his hometown of Belleville, Illinois. He is also an avid bow hunter. Baseball Reference web site (minor league statistics). Hacker, Rich. Multiple interviews, 1982-2010. Retrosheet web site (game logs and trades). Southeastern Illinois College web site (Hall of Fame).